If you're past the age of 25, listen up. The Orlange Anagenese 25+ collection is where you should start on the path to clear, radiant skin. Active ingredients like hibiscus seed extract, collagen and hyaluronic acid work to postpone the signs of aging. 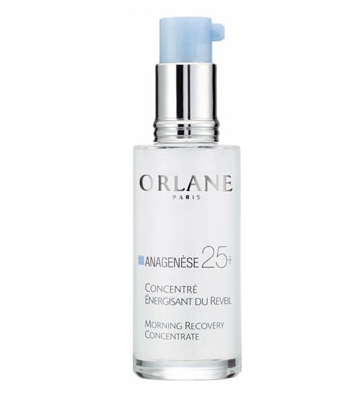 One lucky winner will receive the Orlane Anagenese 25+ Morning Recovery Concentrate First Time-Fighting Serum today, valued at $100! This serum is ideal for giving your skin a healthy glow at the beginning of the day -- and can be applied under your moisturizer. To enter, place your name and email address in the box below. The winner will be selected on Thursday, August 12 and notified by email. This giveaway is open to US residents only. Giveaway runs until Wednesday, August 11 at midnight. One entry per person, email address and IP address. Multiple entries will be disqualified.